This is 'sew' creative Vicky - love the design - it's just perfect! Thanks for joining us again at DCM - it's always a pleasure to see your wonderful works of art. Love this design, very unusual and slightly retro. I like the fabric and the touch of lace. Vicky this is great . . just love everything about your card. It also sums up my life lately too ! Can't wait to see what you now make with your sewing machine. this is just proper lush Vicky - your creations always make me smile. This so cute! I just love that sentiment!! 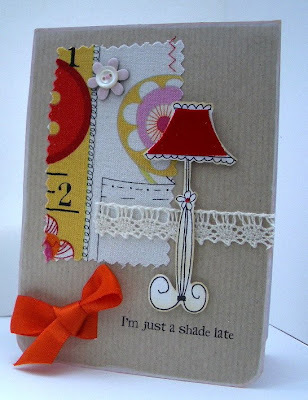 great card, love how you used the bit of fabric and lace! thanks for the fabric link, i want to start sewing too now that my machine is back from repair! hugs!